Great Day in Houston! Booth Bustles with Constant One-On-One Interaction! 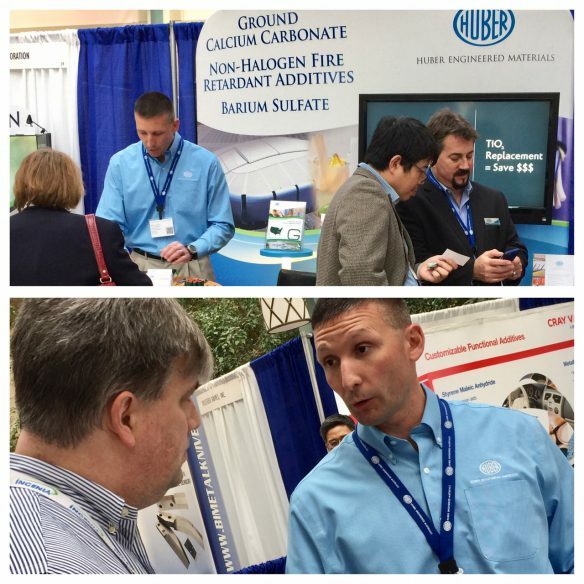 An awesome first day in Houston, Texas, exhibiting at the SPE International Polyolefins Conference. Over 600 are present, and we very much appreciate attendees stopping by booth 38 to learn more about our Halogen-Free Flame Retardants and Smoke Suppressants and Ground Calcium Carbonate and Barium Sulfate grades. A major highlight of day one: the steady stream of visitors to our booth provided us the wonderful opportunity for informative one-on-one interactions. The 2017 trade show season is certainly off to a great start and we look forward to day two of International Polyolefins tomorrow. International Polyolefins is one of our traditional and favorite annual stops to visit live with customers, prospects, distributors and friends. If we don’t have the chance to see you in Houston, many more opportunities await throughout 2017. We look forward to visiting with you live soon! 2017 Trade Show Year Officially Kicks-Off in Two Weeks! Looking Forward to International Polyolefins! Huber Engineered Materials (HEM) is very much looking forward to its first trade show of 2017 when we exhibit Feb. 27-28 in Houston, Texas, at the International Polyolefins Conference. Long a traditional stop for us, we cordially invite you to stop by our “front-and-center” booth 38 location at the Houston Hilton North to learn more about our wide array of high-performing Fire Retardant Additives and Ground Calcium Carbonate products used in a variety of polyolefin and injection molding applications. The friendly venue setting for International Polyolefins offers us the opportunity to casually enjoy visiting with you to learn more about your business and how our engineered specialty ingredients can help with your formulations. We look forward to seeing and visiting with you in Houston soon!